Bee Improvisational: Christmas in July! Other posts on this bee: May Forest of Trees, June Framed Blocks. I am blogging from our patio, using our WiFi. I love it!! As I mentioned already, July is my month for Bee Improvisational. And now I have all of my squares cut! The fabrics are, from left to right: Hip Holidays (by Barbara Jones for Quilt Soup for Henry Glass) Candy Cane in light teal, Have a Sherri Berry Holiday pink ornaments by Sherri Berry for Northcott, this pale green fabric that says Noel all over it (help me out here, this was everywhere 2 years ago and now I can’t remember what it is! 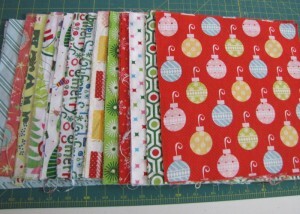 ), Santa Yule Trees from Michael Miller, Merrytown for Studio E, Secret Santa words fabric by Lori Siebert for Benartex in red/green, Secret Santa in blue/green, Hip Holidays cream Christmas presents, Groove Holiday for Robert Kaufman lime Starburst Dots, Hip Holidays red Snowflake Dots, Groove Holiday Diamond Shine, Groove Holiday Retro Glamour, Hip Holidays red Ornaments. I’m sending everyone in the bee 5 10″ squares. I haven’t made my sample blocks yet, but I’m really leaning towards letting everyone make any kind of block they want, as long as it’s 9.5″ square. And I already know what I’m using the blocks for. 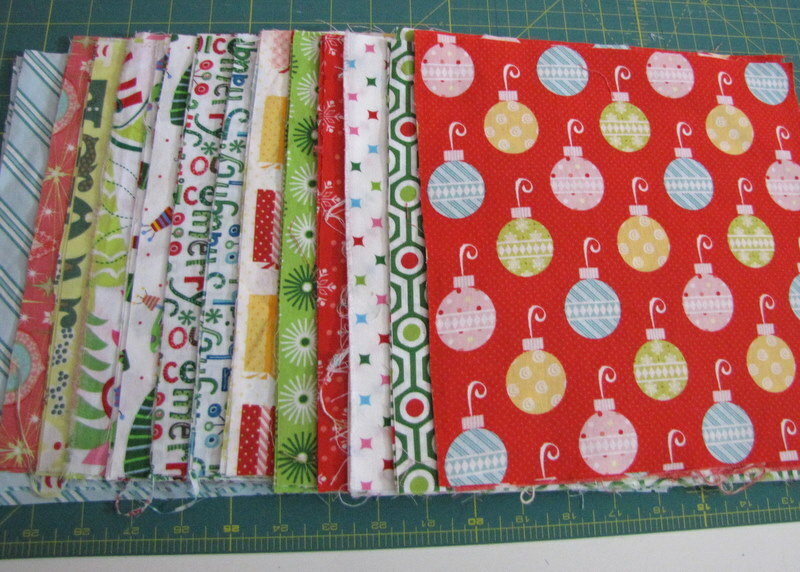 I really want to make a giant Christmas tree skirt, 5 or 6′ square, that covers the ugly tree stand and leaves plenty of room for presents. I figure this is the perfect opportunity since this is one of those projects I’d love to do but might never get around to normally. I’m actually getting pretty excited about having my first turn in a bee.